One of my regular customers called and requested a “Hollywood Themed” birthday cake for her 11 year old daughter. 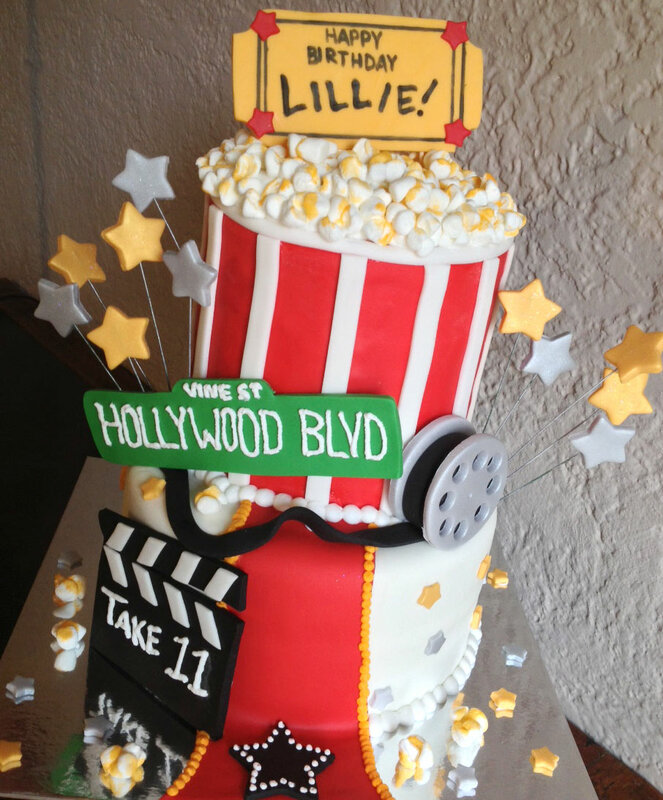 Her party was being held at a local theater and they wanted a movie/Holywood feel for the birthday girl. The mom texted me a picture she had found on Pinterest that was the concept she wanted. The cake was designed well so I stayeed true to the original with a few minor changes to suit the event for my client. I used a new technique that I found on YouTube to make popcorn out of marshmallows (after watching several). I believe it turned out well and gives the cake a true popcorn feel on top. I was excited to make them out of marshmallows instead of fondant since fondant is not as tasty as these sweet treats. My husband could not believe how realistic they turned out. Creating a cake that was an homage to all movies was nice since I have designed cakes for clients from movies like Harry Potter, Iron Man, & Batman and Scarface. Speaking of movies, I am looking forward to Iron Man 3 & the next chapter in the Hunger Games series coming out :). I typically drive out to the AMC theater at the Destin Commons for the big blockbusters. If you could have a cake made after your favorite movie, what would it be? « Backyardigans Birthday Cake – Arrrrrghhh!